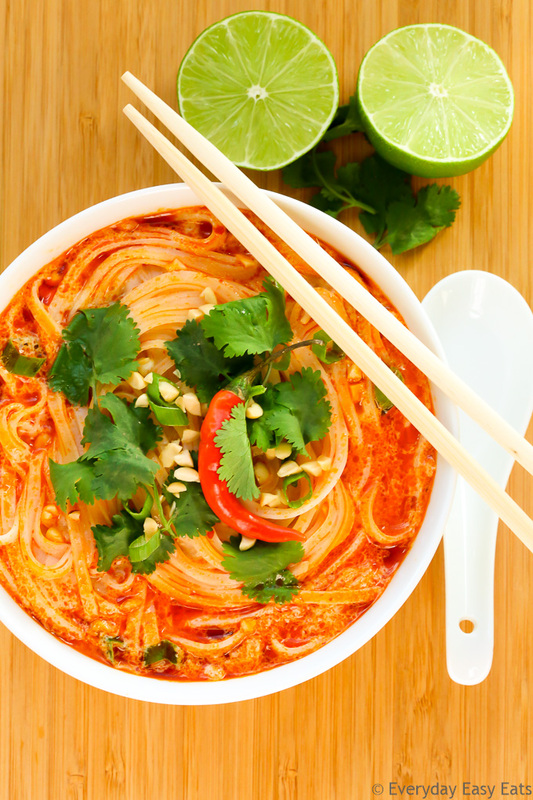 This easy Thai Spicy Noodle Soup recipe is quick, hearty and infused with fragrant Thai flavors. A soul-warming noodle soup that is vegan, gluten-free and requires only 15 minutes to make! If you are a fan of Asian noodle soup bowls, but have never made one before, this Thai Spicy Noodle Soup is the perfect place to start. It is full of complex and bold flavors, but is so simple to make. In this recipe, Thai red curry paste is used to add heat, but gets toned down by the creamy sweetness of coconut milk. Gluten-free rice noodles are incorporated to make the dish super satisfying and only take a few minutes to cook. A splash of lime juice balances and brightens all the flavors in the soup. 1. Make the flavor base: Sauté the garlic, ginger and red curry paste in a hot, oiled pot until fragrant. 2. Add the liquids: Stir in the broth, coconut milk and water and bring to a boil. 3. Cook the noodles: Add the rice noodles to the pot and let them sit until tender. 4. Add lime juice & garnish: Stir in your lime juice at the very end and then garnish the soup with optional toppings, if desired. Tip: For best results, only let the noodles cook in the soup for a few minutes (just until they are softened) and then serve the soup right away. I find that if the noodles sit in the soup for too long after I make it, they tend to absorb a lot of the liquid. This soup recipe is perfectly satiating as it is, but you could add shrimp, tofu or shredded chicken to add protein and make it even heartier. 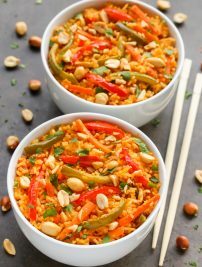 To add a burst of freshness and to make your bowls look extra-pretty, garnish your serving bowls with fresh chopped cilantro, green onions, crushed peanuts and/or red chilies. Thai Red Curry Paste – This is one I use and love! It gives amazing, authentic flavor to Thai dishes and adds the perfect amount of heat. Citrus Juicer – If you cook with a lot of citrus, a sturdy juicer is a must. This one works for both lemons and limes and will squeeze out every last drop of juice like a pro. Worth every penny. Important: If you are vegan, be sure to use a brand of Thai Red Curry Paste that is vegan. The one I use is not, but this red curry paste is vegan and is also very good. In a large pot, heat the oil over medium heat. Add garlic, ginger and curry paste and sauté for 2 minutes to release the curry’s aromas. Stir in the broth, coconut milk and water. Bring to a boil. Add the rice noodles to the pot and allow them to sit for a few minutes until softened. Stir in the lime juice and serve immediately, topped with optional garnishes if using. For best results, serve the soup right away once it is done cooking. If you are not vegan, you can substitute the vegetable broth with chicken broth. Hi Alia, This soup looks SO amazing! I love how creamy it gets with the coconut milk. And how fast it is?!?! Can’t wait to make this during the week. also one more question , all i have is pancit rice noodles , will that work ? or is there another substitute i could use? I LOVED this recipe! I made it two weeks ago and ever since my boyfriend has been BEGGING me to make it again. Can’t wait to have it again tonight 🙂 Thanks so much! Hey Bre! Yay!! That makes me so happy! 🙂 I am so glad you two enjoyed it! I especially love having this soup when I have a cold, because the spicy heat in it warms me right up. You are very welcome!! Hey I’m making this right now and I can’t wait! I’m just curious….In the ingredients list it calls for 4 cups of vegetable/chicken broth but in the directions (#2) it says to add 1 cup water. I went with the 4 cups of broth and didn’t add any extra water I was just curious which was correct or maybe if I’m reading this wrong? Anyway, it’s on the stove and smells good! Is there a yummy substitute for the chicken broth? I’m looking for a gluten free version. I am making this tonight! 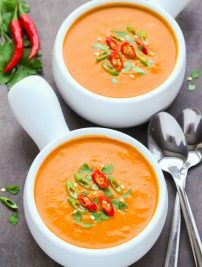 I know it is warm outside, but soup just sounds too good! Thank you for the recipe! It was excellent! I made it exactly as you have it listed here. I topped it with cilantro, crushed peanuts and diced green onions. My 19 year old son broke out a set of chopsticks (I had no idea we had these) and proceeded to eat two huge bowls. Three of us nearly ate the whole pot!! I think next time I’ll try either shrimp or chicken in it, but really its stands fine on its own! Sorry if this is a basic question, but I’m a cooking novice, lol. When would you add in the tofu if you were using it – with the noodles? Would you recommend doing anything with them first, or just letting them marinate in the pot? Thanks! Hey Nish! No worries, that is a perfectly valid question. 🙂 Personally, when I am cooking with tofu, I like to crisp it up a bit in a frying pan before cooking anything else. I made this soup last night. I think I messed up? I cooked the noodles in the soup. The noodles absorbed the soup. The flavor was very good but I think next time I will cook the noodles separately and add them to the bowl at plating . It could have been the noodles I used. They were a little thick not the super thin ones. Hi Camela! Aww that’s too bad the soup didn’t turn out as you wanted. I usually use medium-sized rice noodles to make this soup. I love this recipe. I had to cook noodles twice the recommended time that the box recommended, about 16 mins to get noodles soft . And by that time the soup had thicken but poring more hot water thins it out. I will definitely make this again and add chicken. It’s like the Thai version of chicken soup. This soup was delicious! Just what I was looking for on a frigid Michigan winter night. This recipe will definitely be made again and again! I added some matchstick carrots, red cabbage and bok choy before the addition of lime juice and noodles and loved the comforting and warming flavors! Thank you for sharing! Any suggestions for leftovers? The noodles seem to be sucking up all the broth. I’m thinking pan fried noodles for tomorrow’s lunch. Hi Jessica! Thanks so much! All of the extra vegetables you added would definitely take this recipe over the top! I usually never have leftovers haha! Hi Alia, I looked up the red curry paste you recommend and it contains shrimp paste so the recipe is not vegan. Just fyi. Thanks Alia. That is really helpful since I don’t eat fish. Loved this! Added a whole bunch of veggies before I added the liquid. Added cooked chicken at the end and i put noodled into each bowl with boiling water until soft and then drained and added the soup to the cooked noodles. Big hit. This was a great lunch on a cold winter Alaskan day. Thanks for sharing! I would love to know what rice noodles you use. The 2 kinds of rice noodles that my grocery sells is vermicelli and straight cut, both by the brand A Taste Of Thai. One looks like angel hair and one looks like the kind you use in pad thai. I used the straight cut bc that is what it looks like in the picture but am curious to the ones you use in the recipe. It is cooking right now but the broth is absolutely delicious. I sautéed onions and chicken in butter/coconut oil before adding the rest of the ingredients you suggest. So good!!!! Hi Amy! I just added a link to the exact noodles I use in the recipe card above. They are called medium rice stick noodles and they sound just like the straight cut noodles you described, because they similar to Pad Thai noodles. So it sounds like you made the right choice! This is seriously the BEST Thai soup I have made. I have made several bc we love Thai. My husband even said it could be sold in a Thai restaurant, it’s that good. I added 1 chopped yellow onion and 4 thin chicken breast to butter/coconut oil and sauté in a dutch oven. Then followed her recipe (but doubled it bc my guys eat a lot) and added her suggested toppings of cilantro, green onion and chopped peanuts. I hope you try this, you will not be disappointed! Hi again Amy! Oh my gosh that makes me so happy!! Thank you so much! I am so glad you and your family enjoyed the recipe. You will have to try some of my other recipes sometime! 🙂 I am going to add another Thai recipe soon so keep an eye out for that one. 😉 Have a great week! I just cooked it. I added some tofu in it and it’s very delicious 🤤, plus it cooks in no time 😊. Hi Alex! I am so glad you liked the soup! Tofu is a great addition. 🙂 Thanks so much for letting me know! Hey would the broth be good the next day if you took the noodles out? Yummy, easy recipe. Added chicken,onion and shredded carrots, made it a hearty soup. Easy to make too! Hi! Can you add veggies? Peppers and broccoli? Want some keto diet recipes for following my keto diet please as need to be able to eat while at work.